In today’s article, I’ve decided to cover a topic that makes you, as a car enthusiast, very angry. Not just a little angry, like you get when people insist on texting even though they’re the first car at a green arrow that lasts as long as a roll of toilet paper in the 7th Heaven household. No, no. I mean really angry. In fact, I believe today’s subject is possibly the most hated topic a car enthusiast can imagine. Of course, at this point, I already know what you’re thinking. You’re thinking: How can you write an entire column about people who name their Priuses? But this isn’t about that. It’s worse. It’s about … dun dun dun … the front license plate. Car enthusiasts, I have discovered, believe the front license plate is the automotive equivalent of Satan. Seriously: to hear the average car enthusiast talk about it, we’d all rather have our daily drivers replaced with a Smart car powered by a kitchen timer than harm our poor, beloved front bumper with a license plate. For a little perspective, I turn us to the CVT, which is another severely hated car enthusiast item. Last week, I wrote an article on CVTs in which I asserted, while simultaneously looking over my shoulder, that CVTs are not so bad. Interestingly, it went over quite well, earning approving comments from greater than three people. But things wouldn’t turn out so well if I covered front license plates with the same positivity. No, they would certainly not. You would become enraged and petition Matt Hardigree to never again share one of my articles, and I would just be a guy with an automatic Cadillac who sits around all day eating Cocoa Puffs. So I’m not going to do that, largely because there aren’t many good things to say about the front license plate from a car enthusiast perspective. In fact, the only positive front license plate-related comment I can offer is that my home state, Georgia, does not use them. On this subject, I must say to all of you in California, or Chicago, or New York, or London, who believe your area is better than Georgia just because you don’t take Robert E. Lee’s Birthday as a government holiday: neener, neener, neener! That&apos;s an oil cooler painted to look like a license plate. I know, right? 1. Smaller front license plates. This is how they handle the situation in Monaco, and it’s brilliant. Here’s how it works: the government of Monaco realizes that everyone who lives there owns an exotic sports car whose front bumper is worth more than most of Eastern Europe. So while the rear license plate is normal sized, the front one is about as big as a toenail. It’s great, unless of course you’re trying to track someone down for speeding. But you aren’t, since everyone in Monaco drives approximately 19 miles per hour while looking around to see if anyone notices them. 2. Magnetic front license plates. OK, so we’re required to have a front plate. But why not make it a magnet? That means car enthusiasts can place it anywhere on the front of the car, which may finally get people to stop making those jokes about how the front license plate of an RX-8 looks like a tooth. 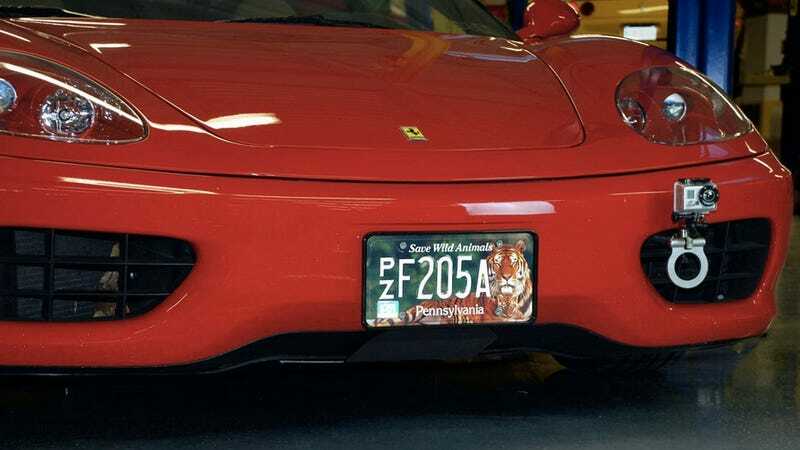 Seriously: I believe, after considerable research into the matter (in other words: I made this up), that the latest New York plate is that hideous shade of orange because some RX-8-driving DMV administrator got tired of hearing tooth jokes back when the plate was white. 3. “No front license plate” tax. This is my most brilliant idea yet, aside from that whole thing about buying unreliable used cars from CarMax. Here’s how it works: those of us who don’t want a front plate can opt out by paying some sort of annual “no front license plate” fee. Then we put some tiny little official sticker on the windshield that shows we don’t require a front plate, which keeps the cops from pulling us over. This is a great idea, largely because those of us who pay can drive around and laugh at all the RX-8 guys who didn’t opt out, and therefore have a tooth on the front of their cars. Clearly, I have solved our nation’s front license plate problem. Now, we must go to our state legislatures and convince them to adopt one of these brilliant strategies. We car enthusiasts can do this! We car enthusiasts can do anything! We car enthusiasts cannot be stopped! Unless, of course, we don’t have a front license plate.